Cruises from Athens (Piraeus) depart from spring through fall. Piraeus is the port to Athens -- the birthplace of Western civilization. 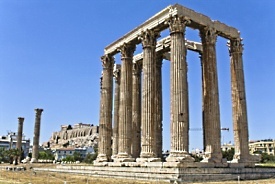 The first stop on most excursions is the Parthenon on the hill of the Acropolis. The Acropolis also is the site of the Propylea, the Temple of the Wingless Victory, the Erechtheion and the Acropolis Museum. A drive down Syngrou Avenue offers an impressive view of the Arch of Hadrian and the Temple of Olympian Zeus. The National Archeological Museum houses a rich collection of antiquities. Head to Attiki Odos/A62 and drive for 6km, continue onto Leof. Koropiou Aerodromiou. After that, use any lane to turn left onto Leof. Varis Koropiou (signs for Glyfada/Vari.) Drive on Leof. Varis Koropiou for 10km, continue onto Leof. Varis Varkizis for 2km. Use the right two lanes to turn right onto Leof. Kon/nou Karamanli (signs for Mediterraneo Hospital.) Stay on this road for 14 km, then stay left to continue on, and go for another 4km. Use any lane to turn left onto Eth. Antistaseos, then any lane to turn right onto Dim. Gounari. Stay on Dim. Gounari until you reach Atki Posidonos, and use the left two lanes to turn left onto it. Go 1km then take a slight right onto Atki Miaouli, then after 1km, turn right to stay onto Atki Miaouli. Your destination will be Akti Miaouli 10.